The Dow Jones Industrial Average today (Tuesday) added 89 points as energy stocks surged despite supply concerns around the globe. Energy stocks are now up 23% since August, but still remain down 10% year to date. The Nasdaq continued to gather steam, adding 17 points as the exchange prepares for a busy day of earnings on Wednesday. The tech sector added roughly 0.5% after shares of Apple Inc. (Nasdaq: AAPL) and Microsoft Corp. (Nasdaq: MSFT) each rose more than 1.2%. 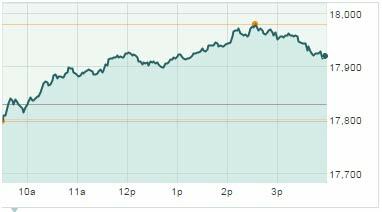 Stock Market News: Seven of 10 S&P sectors were in the green today, with energy stocks surging nearly 2.5%. The boost to crude was a boon for multinational producers and companies engaged in oilfield services. Shares of Exxon Mobil Corp. (NYSE: XOM) were up 1.8%, while shares of Chevron Corp. (NYSE: CVX) added 3.4%. Today's biggest winner on volume and performance was Pioneer Natural Resources (NYSE: PXD), which added more than 6.6% in a busy day of trading. Meanwhile, shares of Unit Corp. (NYSE: UNT) added 21% after reporting strong third-quarter earnings. Oil In Focus: Oil prices rose on Tuesday as production problems in Brazil and Libya raised concerns about short-term supply on the global markets. December WTI oil prices gained 3.8% to hit $47.90 per barrel, while Brent crude prices gained 3.6% to hit $50.54. On Tuesday, the Dow Jones surged as oil prices rocketed more than 3.5%. Libya's production levels are well below capacity, and the nation has halted exports from its busy Zueitina port due to infighting among politicians. Meanwhile, in Brazil, the nation's largest oil producing union has walked out of the job as they protest proposed cuts by Petrobas. Here's a breakdown of the geopolitical events moving prices today. On Tap Tomorrow: On Wednesday, five members of the U.S. Federal Reserve will speak, including testimony by Fed Chairwoman Janet Yellen before the House Financial Services Committee. Traders will seek any hints on when the central bank may raise interest rates. Meanwhile, the jobs market will be in focus with the release of the October ADP private employment report. Investors will also parse through monthly data on international trade, weekly oil inventories, and the PMI Services Index. Companies reporting earnings include Facebook Inc. (Nasdaq: FB), Michael Kors Holdings Ltd. (NYSE: KORS), 3D Systems Corp. (NYSE: DDD), Sodastream International Ltd. (Nasdaq: SODA), Whole Foods Market Inc. (Nasdaq: WFM), QUALCOMM Inc. (Nasdaq: QCOM), and Transocean Ltd. (NYSE: RIG). Stocks to Watch No. 1, TRP: Shares of TransCanada Corp. (NYSE: TRP) added nearly 1% on news the company is planning to create a project known as Energy East, an all-Canadian alternative pipeline to the Keystone XL pipeline. The company said it will soon announce the route and the location of a brand new export terminal after it canceled development plans in Quebec due to environmental concerns. Be sure to check out today's insight on the Keystone Pipeline delay story that no one in Washington seems to be talking about, right here. Stocks to Watch: No. 2, ATVI: This morning, Activision Blizzard Inc.(Nasdaq: ATVI) reported quarterly earnings of $0.21 per share on revenue of $1.04 billion. The figures crushed quarter estimates expected by Wall Street and came after the company announced its $5.9 billion purchase of "Candy Crush" maker King Digital Entertainment Plc. (NYSE: KING). Analysts projected a consensus return of $0.16 per share on revenue of $946.7 billion. Here's a breakdown of why Activision stock has some very nice upside for investors. Stocks to Watch No. 3, GILD: Biotech stocks remain in focus as the drama surrounding Valeant Pharmaceuticals Intl. Inc. (NYSE: VRX) continues to weigh on investor sentiment. But right now, there's one must-own biotech giant that you should be considering. That stock is Gilead Sciences Inc. (Nasdaq: GILD). Shares are a must buy, according to Money MorningDefense & Tech Specialist Michael A. Robinson. Here's a breakdown of how you can make 66.5% on this stock in the near future. Stocks to Watch No. 4, AIG: Shares of American International Group Inc. (NYSE: AIG) slumped more than 4% after the company missed profit expectations by a considerable amount for the third quarter. The company has been under significant pressure from activist investor Carl Icahn to break up into several publicly traded entities. However, the company's CEO Peter Hancock said the break-up proposal did not "make financial sense."